War and famine, earthquake and flood, poverty and poor prospects drive various peoples of the world from their homes to other lands around the globe. Some of them go loaded like mules; others don’t have time to pack a case. What would you bring if you had 1 week, 1 day, 1 hour to get your things together and go? Will that which is familiar to you adapt or disappear? 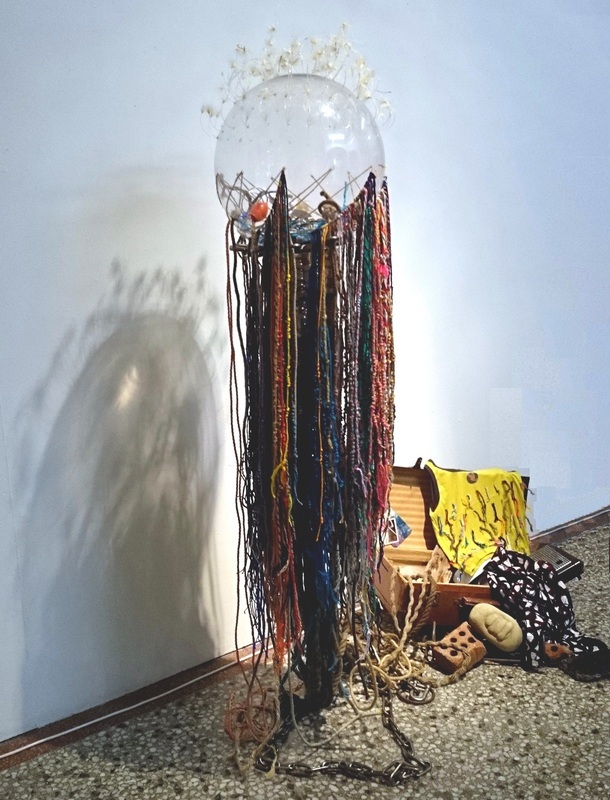 In this piece, a plastic time-capsule is buoyed up by cardoon seeds and tethered via macramé work (wools, cotton on boat ropes) and steel chain to a suitcase from which memories of home lands spill out. UNHCR refugee statistics for the year of 2012 are knotted into the quipu that skirts the globe. Though each knot represents a person’s story, the sense of the individual journey become lost to the vastness of numbers.